294 pages | 5 B/W Illus. 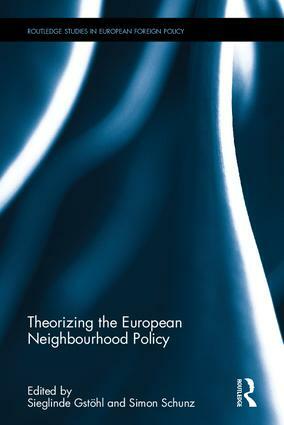 "The volume is a very successful example of an eclectic perspective which tackles a wide range of aspects of the ENP, but is also unified by the larger finding that this policy has been largely EU-centric, which in turn, has hindered the EU’s ability to influence developments in the neighbourhood… the volume is an important breakthrough in the study of the EU’s approach towards its neighbours." Part III: The EU and the Other(s): Conflict or Cooperation? Sieglinde Gstöhl is Director of the Department of EU International Relations and Diplomacy Studies at the College of Europe in Bruges, Belgium. She has been full-time professor at the College since 2005. From 1999-2005 she was Assistant Professor of International Relations at Humboldt University Berlin. She holds a PhD and an MA in International Relations from the Graduate Institute of International and Development Studies in Geneva as well as a degree in Public Affairs from the University of St. Gallen. She was, inter alia, a research fellow at the Liechtenstein Institute and at the Center for International Affairs at Harvard University. Simon Schunz is Professor in the Department of EU International Relations and Diplomacy Studies at the College of Europe in Bruges. He previously worked, inter alia, for DG Research and Innovation of the European Commission, where he was in charge of the social sciences research on the EU as a global actor, including its neighbourhood policies, and the University of Leuven (KU Leuven), where he continues to lecture. It is a timely moment to launch a new series on European foreign policy. Europe and the EU now face multiple challenges including: conflict in the Middle East and the rise of radical jihadist groups like Islamic State; assertive Russian action in Ukraine and other countries on the EU’s eastern borders; the strategic ambitions of rising powers; and the euro crisis’ impact on the EU’s global power. Additionally, the Union’s own internal institutional processes have undergone far-reaching change in recent years and a plethora of new strategies has been introduced covering Asia, trade, counter-terrorism, democracy and human rights, geo-economics, and other regions and topics. This series will address the standard range of conceptual and theoretical questions related to European foreign policy. At the same time, in response to the intensity of new policy developments, it endeavors to ensure that it also has a topical flavor, addressing the most important and evolving challenges to European foreign policy, in a way that will be relevant to the policy-making and think-tank communities. Europe’s relationship to its southern neighbours in the Mediterranean and in the Sahel and the Horn of Africa. Professor Richard G. Whitman is Professor of Politics and International Relations at the University of Kent. Professor Richard YOUNGS is Professor of International Relations at the University of Warwick and Senior Associate at the Carnegie Endowment for International Peace.